These were the formative years for the future leader of the financial world. The idea that anyone could completely alter someone else’s reality must have captivated him then, as it clearly does now. How else to explain the market’s rise after one of the world’s biggest banks admitted to [tip: think icebergs] a $2 billion trading loss on what they insisted was a matched book? Now, $2 billion isn’t going to ruin JP Morgan Chase. They have $1.2 trillion in assets and $112 billion in Tier 1 capital. The ruinous aspect of this news is that they, as some of the smartest guys in the room, have lost control of their derivatives trading. In one of Bernanke’s first televised post-fed meeting interviews, Dimon joined in the Q&A, bashing Bernanke for the litany of regulations and reforms that were preventing the financial community from recovering from the financial crisis. Needless to say, there was no mention made of his role leadership in creating the crisis. There’s an old adage in banking: if I owe you $100 and can’t repay it, I’m in trouble. If I owe you $1 million and can’t repay it, you’re in trouble. While the TARP loans have long since been repaid, Wall Street’s survival is still very much in the hands of its enablers — the Fed. I’m reminded of the old Abbott and Costello sketch, Who’s on first? The audience knows that Who is actually the first baseman’s name, but the coach, played by Mr. Dimon has no clue Who is on the team (pun intended) or What’s on second…etc. Oh well, back to the cave now to stare at the wall. Love that sketch. 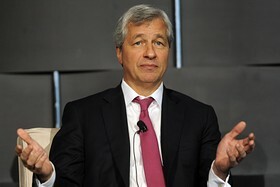 Anyone see Dimon on Meet the Press yesterday? LA Times put out a fantastic article this morning that echoes my thoughts precisely. Played the bounce, now back into my short pants looking for the low 1300’s target you have outlined. Let’s go tag it! Have a good weekend Pebble. Always love the blog. Thanks, ewt. Of course, they can afford any cost as long as we’re willing to back stop their swings for the fences.